It shouldn’t take rocket science to figure out how to put on perfume. You just spritz it on your wrists, rub them on each other and behind your ears, and you’re good to go, right? Maybe. But since you’ve spent almost a hundred dollars for that fabulous bottle of Guerlain Chamade or Chanel Eau Première, you may as well do a little research on how to wear it well. Cloud of scent or targeted sprays? Some people spray a mist of perfume in the air and then walk through it. They say that the scent then disperses evenly over their bodies. (I first saw this technique used by Holly Hunter’s character in the movie Broadcast News.) When I’ve tried it, I’ve never felt satisfied by the concentration of the scent. Plus, if you walk through the cloud of scent clothed, not much perfume lands on skin where it can warm and develop. I like targeting sprays of perfume. I mostly wear dresses and skirts, so I tend to spray once behind each knee. The scent then warms and rises so that it leaves a quiet trail. If the fragrance is subtle, or if I’m especially in love with it, I’ll spray once between my breasts, too, so that the scent is closer to my nose. I do scent my wrists sometimes so that I can lift my wrist to my nose and get to know a perfume better. Another place I like to dab scent if I’m testing it is on the fleshy part of the back of my hand, between my thumb and index finger. Caron sprays its customer’s scarves so they can live with a perfume before deciding to buy it. Diaghilev sprayed his curtains with Guerlain Mitsouko. I spray my sheets with scent and haven’t stained them yet. Why not scent your scarf or woolen gloves if you feel like it? Rub or let dry? Perfume folk wisdom says not to rub your wrists together when you apply perfume because you’ll crush its molecules. I’m not a physicist and I don’t know what it takes to crush a molecule (although I hear that splitting atoms takes special equipment and sometimes a treaty). I always let my perfume dry without rubbing my wrists together because I like how it smells when it’s sprayed rather than dabbed, and to me rubbing it on skin is too much like dabbing it. What about splash bottles? Bottles of extrait most often come in splash bottles — that is, bottles without a sprayer. Many Eaux de Toilette do, too. As I said, I like how perfume smells when it’s sprayed, so I like to decant Eau de Toilette into an atomizer. Sprayed extrait can be wonderful, too — I fell head over heels for Guerlain Vol de Nuit and Chamade when I smelled the parfum after it was sprayed on my skin. But for a quarter-ounce bottle of precious extrait, a cheap atomizer feels wrong. So I dab it. The problem with dabbing is that if you dab by uncapping the bottle and turning it directly on your skin or your finger, when you right the bottle you’ve swished oil and even flakes of skin into the scent. You can end up spoiling the fragrance before its time. One solution is to dip a clean Q-tip into the scent and use that to dab perfume. I tried this method for a while, but I felt like the Q-tip held too much of the valuable extrait even when I’d squeezed it dry. Now I turn the bottle upside down to moisten the stopper, dab perfume on my skin with the stopper, then wipe the stopper on a handy cloth (usually my blouse or the skirt of my dress). When to reapply? As much as I love a perfume, I’m happy when it fades because I can apply a different perfume. But if you want to boost your scent, for the truest fragrance make sure that the first application has disappeared from your skin. Perfume won’t show its true character if it is layered — even if it’s layered over itself. A scent is designed to unfurl on naked skin from its topnotes through the final whisper of its drydown. If you interrupt and complicate this progress by reapplying scent, you won’t smell the full story of the perfume. In the end, though the best advice I’ve heard about applying perfume was to “Be extravagant with perfume and with love.” I wish I could remember who wrote it. More perfumista tips: How to decant perfume, How to get fragrance samples, free or otherwise, How to remove fragrance from skin. Image: Joan Crawford selling perfume in The Women. I just love your articles Angela, it really feels like we're sitting around just talking about these things! Some perfume is so strong on me I have to do the walking through the cloud thing (ahem, Chloe) just after a shower. My everyday habit is just a spray straight at the upper chest (that's plenty for work). A good spot for big silage is the base of my hair in back. I have long hair and that keeps it warm and sends it around when I move. *Did you hear they are remaking the movie “The Women”, I loved the original. Angela will be along to answer you I'm sure, but chiming in because I chose the picture — it is one of my favorite movies of all time, along with My Man Godfrey. And did hear that they were remaking it, and wasn't particularly pleased! I mean, I like Meg Ryan, but it just seems WRONG. It's true that some fragrances are just too strong to apply the regular way. (A spritz of DelRae Amoureuse, for instance, could take out a whole busload of commuters!) Another way I've heard of applying a really strong scent is to put unscented lotion on your hands, spray into the lotion, then rub the lotion on your arms and legs. I love the idea of spraying at the nape of your neck! I'm going to do that today. I have long hair, too. I did hear about a remake, but I'm with Robin–it seems wrong wrong wrong! The movie is so anachronistic today that making a modern version seems impossible. Wouldn't you love to step into the perfume scene and check out what is behind the counter? The older I get and the longer I've been married (10 yrs now) the more that movie can just break my heart! If they were trying to do a straight remake (script and all) it would be a disaster. But the theme is timeless and with the right cast/writing it could be at least watchable. I'm just keeping my fingers crossed that with that many women involved in the production they won't let it go the sappy chick-flick route and keep it smart. I love My Man Godfrey, too! Carole Lombard was the perfect combination of unselfconscious beauty and hilariousness. William Powell is o.k. in my book, too. Angie, I have been a fan since your very first article – it really does feel like we're chatting over a cup of steaming coffee/tea And your bracketed asides — Get a more distinctive coat, I say — I just love them! I usually apply two sprays directly to each side of the neck, although with some perfume one is more than enough (am talking to you, Musc Ravageur). What I also like to do is spritz onto my supersternal notch (the hollow between the collar bones) cos that way I can enjoy the scent wafting upwards. Also prefer spraying to dabbing for all the reasons you mentioned and have been known to overapply (apologies to my fellow commuters!). A trail of scent on your clothes can sometimes smell more wonderful than applied to skin, but I'm afraid I don't have as many sweaters/sweats as I do fragrances. …I'll keep my fingers crossed that it's a good remake, but I'm skeptical. Oh, let's hope so! I'd hate to see The Women made into a sappy chick-flick. Thank you, D! The aside about coats was heartfelt. I have way too many coats, most of them from the 1950s. It's true that there's something nice about picking up a sweater from the day before and smelling perfume mixed with a person's own scent. I think I've fallen in love on less. What a fun article. When I was younger, I thought the stepping-into-the-cloud method of applying scent was very elegant, but now it just seems wasteful compared to spraying it where one wants it. Delightful article, Angela! Just thinking about applying fragrance makes me instantly happy. For some reason, I seem to automatically apply fragrance to the backs of my hands. When I'm writing/on the keyboard, which is much of my day, the scent wafts up to my nostrils in a very practical A to B way, and if I want a closer inspection I just lift my hand to my nose without any wasted motion! I love the idea of behind the neck under the hair. I instinctively do that at night before bed, for fragrant “spooning” with my DH. Why do things smell better sprayed than dabbed? They just do, mostly, don't they? I've gotten in my habit for my sampling to dump vials into atomizers, because that can give a completely different read on a fragrance. It makes no sense to me, but there it is. And I apply differently depending on the fragrance and the way I want to wear it. Sometimes it's a discreet dab of something I can sniff on my wrist. If it's a “wafter” (a lot of my favorite fragrances are those more subtle skin scents) I like to apply to my knees and chest as well — the smell drifts up all day, subtly, like a force field of happiness. And I do like to walk through sprays because I am very fond of the way scents (even different scents) cling to clothing, at least in cooler months. There is something about putting on a coat and catching, say, a whiff of Mitsouko or Black Cashmere that makes me absurdly happy, as if some outside force had selected my fragrance. Anyway, lovely post as always, and thanks. I apply on each side of the neck, or at the temples. I like the idea of applying behind the knees, but, living in a cold climate, I wear double layers of thick tights for a large portion of the year, so that feels rather wasteful. When applied at the neck the fragrance transfers nicely to my cashmere scarf, though, so there are more or less permanent traces of whatever I've been wearing lately in it. I really enjoy that, both the familiar smell of my own favourite perfumes in my own scarf, and encountering other people's fragrances wafting out of their outerwear. And I apply rather a lot. I have skin that eats fragrance, that's why I'm drawn to olfactory monsters like Angel; they stay with me, unlike many more timid perfumes. A friend came over with a huge box of BPAL samples the other day, and of the eight or nine I tried on skin, only two lasted for more than a bare half hour; the rest just vanished into thin air. Could reflect on the quality of BPAL more than anything, perhaps, but that's my experience with most fragrances. Great post! I apply scent behind my ears, on my wrists, and in my hair – I have very oily hair, so anything that might dry it out is fine by me. I do have a signature scent – Caron N'Aimez Que Moi – but I also have about ten “co-signatures”! My coat is bright blue so it's always easy to identify, anyway. I agree, spraying one's scarf is a great idea: Mine currently smells of FM Lipstick Rose! Oh, God, Elizabeth, I want your scarf to wear! They're sold out of Lipstick Rose here in Vancouver until mid-December and I'm positively smitten and longing to own it. Just reading the name here brought a smile to my lips. Thank you!! Thinking of The Women, too, and imagining that they'd all adore that fragrance; it's so modern and yet so cheekily retro. I hope you like The Women! Maybe it's time for me to rewatch it, to.. I do love a nice coat. It is more difficult to spray behind the knees when you're legs are swaddled in wool. I do sometimes wear tights, but more often I wear knee socks with boots, so I have exposed area behind the kness. Sometimes my knees do get cold, though. I'm knitting leg warmers right now, in fact. You smell great! My scarf is full of Theorama right now. I can't help but think there might be a little Narcisse Noir happening, too, in that bathroom scene with the mistress. Aww…I hope Lipstick Rose lands in Vancouver soon! The Women is one of my favorite movies! I saw the play when it was revived on Broadway a few years back. It starred Cynthia Nixon and Jennifer Tilly, I think. I loved it – they really got the tone just right. Great article as usual, Angela. I'm a dabber, mostly. Sometimes I even decant my sprays in order to dab them (Black Cashmere went from overwhelming to fabulous for me this way.) Though I agree with March that some fragrances simply aren't themselves without spraying. And I simply *must* rub –albeit very gently. Sometimes I try hard not to do so, just to see if it makes a difference, but it takes aways something ritual and sensual from my application process and that's just not worth it to me, most of the time. For the same reason I prefer wrists, neck (like a necklace, when dabbing, especially love the nape), and between the breasts as opposed to knees, back of hand. But then, that's probably more a comment on “where one wishes to be kissed” as Chanel said, than how I like my sillage! And while I also totally agree with you about perfume being intended for naked skin, as a chronic under-applier I often find that I don't “get” a new sample until I reapply over the faded perfume. Thanks Elizabeth! Angela, I love Theorama. My scarf's got SL Louve. I wish I didn't seem like the ONLY girl who likes this scent. Anyone else out there to keep me company??!! I'm a a rubber myself, but I certainly understand those from the other school, although the molecule argument makes absolutely no scientific sense to me either. I was in Sephora yesterday and a SA jumped out and chastisized this woman for rubbing her wrists together, insisting “It crushes the molecules down into their constituent parts.” Seeing how reliable they are on notes, I'm not very inclined to trust SAs on their physics. But there is no denying I'm very geeky – I sometimes apply scents in splash bottles with a decanting pipette. I haven't even tried Louve yet! Maybe I'll remedy that this afternoon. I've always wondered about that “where you want to be kissed” comment. After all, have you tasted perfume? It's not very tasty. I agree with you that ritual is important with perfume. I think that's part of why I let it dry without rubbing–it's part of my ritual. Who would have thought there would be so much to say about applying fragrance! Such a great idea, Angela. To ahtx, I'm glad to hear I'm not alone. I often seem to get more out of a fragrance if I reapply over the half-faded first application. I then experience everything — top, middle and base notes — most intensely. I don't really see why that has to be an absolute no-no, if it works for us! Well, with a “number of good strings of pearls” it's no wonder you don't wear rhinestones! I think Coco liked the fakes as well as real pearls–I bet she sprayed perfume all over them. Still, one day when you're feeling it, I recommend a good quality rhinestone brooch with large, clear crystals to wear on your coat. Yeah, that molecule argument is pretty suspicious. I think it's one of those childhood memory things for me, Angela. The bitter almond reminds me of Jergen's lotion, which was the very first “grown-up” item I ever owned. Then the rose comes in and it's all so confection-y. In fact, speaking of Lipstick Rose earlier, both frags to me have a little of that Turkish Delight ambience in common! Do try it and tell me what you think. It's not been exactly popular on this site. . .
Lots of people layer scent. If you like it, you should definitely do it! Plus, sometimes the topnotes are the best part, and it's hard to resist getting another hit of them. The back of the hands sounds like a good idea, and I'm definitely inspired by the nape of the neck suggestion. P.S. The Women remade? Oh dear. Maybe in France they could do it. Or England. But here…? What's happened to our poor American celebrities, anyway? “Crush the molecules”?? I'm no physicist either, but I'm pretty darn sure that “ain't gonna happen.” I often spray my wrists and rub my to get coverage up my forearms a bit. I'm also either a “scent eater” or wear mostly lighter scents that require heavy application to even have a presence. I'm really disappointed if I can't smell myself after an hour and a half. I usually do my forearms or inside of elbows, neck (often behind each ear) and heavily in that “suprasternal notch” to ensure that I get a little on my shirt, which I love sniffing after it's faded on my skin. I'm also in the camp that sometimes reapplies/layers the same scent before the drydown completely dissipates. Great piece! I think the key is to put scent on the parts of your body that warm up, like you do. The inside of the elbows sounds like a great place. My skin eats certain notes, too, it seems. Although yesterday I wore Micallef Automne, and I practically had to burn it off to remove it at the end of the day. I'd totally forgotten about Jungle Red! Pretty symbolic, when you think about it. This will certainly be understood without me saying so, but if I'm wearing something for the first time or two, I either apply very lightly or sample only in the privacy of my own home (in which I live alone!) to avoid rather embarrassing social situations. I've gotten a comment on Voleur de Roses at work, but fortunately it was complimentary. I also don't want to be far from home if a scrubber starts making me physically ill! That actually started happening once with Concentree d'Orange Verte even though I love that scent! I read in the allure book that rubbing the wrists will not break down the molecules. Some chemist wrote in to say it was a very hard thing to do in her job. It must be the top layer of dead skin that just doesn't smell right with some perfumes when rubbed… I just spray on the neck or wrist and let it be. My grandmother had a fabulous collection of rhinestone-encrusted costume jewellery, but in his grief after her death, it appears my grandfather got rid of many of her pieces. Too bad, because even though I very very rarely wear any sort of “sparkly” (what we call jewellery around here), I would have liked to have a piece or two. The pearls I have inherited or been gifted, and I don't wear any of them nearly as much as I should. It's interesting to note that not only do the fragrances themselves go in and out of fashion, but so do the methods of applying them. My grandmother, from whom I learned that a woman is never 'dressed' if she hasn't applied fragrance, had a distinct application ritual which strikes me as very much the product of her times. She would dab all the pulse points -behind the ear, inner wrists, and backs of the knees first. Then she would apply scent to a cotton ball which she placed inside her bra, between the breasts. Finally, she would apply fragrance to an embroidered lace hankie and put it in her handbag. The purpose of the fragrance in the handbag, I was told, was to act as a reminder of one's scent, as no true lady would reapply her scent in public. I've also found that some of the perfume oils do better for me if mixed with the unscented lotion (Kai in particular disappears fast if I don't do this). I'm bad about “wasting” perfume in all the wrong places for the short term effects – my linens, my clothes, throw pillows and blankets, my car (which smells faintly like Chanel 5 right now). Life is short -if you've got it, surround yourself with it and *enjoy* it! Tonight I'm just happy sitting here with the scent of my daughter's hot cocoa and our Christmas tree – doesn't get much better than that! In order to be able to smell the perfume you're wearing, dab it as far as possible from your nose: between your breasts, for instance, a few whiffs will waft up to your nostrils, or on your wrists, which you can lift to your face whenever you wish. I have a few nice rhinestone pieces. Who knows? Maybe one of them used to be your grandmother's. I hope we'll visit someday and you can tell me if you remember any of them on your grandmother's dresses. Great advice. I've gone wild a few times and sprayed something new at the mall on my skin and had to take an antacid when I got home. I'm a fan of Voleur, too. I bet it smells great on a man. You know, I'll never use up all my perfume. Why not scent the car? I sure do love the smells you're describing now! Hurray for Serge! Great advice, and it sounds so much more profound in French. Dab a cotton ball and stuff it halfway through an air vent, beats the awful car air fresheners any day! *Call me crazy, but there are a lot of days I wish little hats and gloves and circle skirts were still in fashion! I look so cute in hats! LOL! I I think I'll wear my pearls tomorrow…. You're lucky to look good in hats–I sure don't! I'll take the gloves, though. I love the cotton ball in the air vent idea! I have a long commute, so I'm going to have to try this! I have never heard this before, and now I am thoroughly creeped out by my own habits. Apparently I want to be kissed squarely on the insides of my forearms! I'd like to second everybody's opinion about how lovely your articles are, and how much it feels as if we're sitting somewhere near the fireplace, talking, with cup of coffee or tea in hand. Personally I generally prefer to dab, but in the summertime I love to store my scents in the freezer and then spray with abandon (either directly on skin or in the air and walking through). As for the application of extrait, I also wet the stopper and apply with it – to me it's a very sensual act. I also love the way a scarf smells after it's picked up one's fragrance, heavenly. I have just remembered something: in France, years ago, whenever you bought something in a parfumerie or at the perfume counter of a department store,. the SA would ask, 'Je vous parfume?' If you said yes, she would ask you what you liked and she would grab a bottle and spray you practically all over (none of this tiny spritz on the wrist, or even less on a 'mouillette'). You would stand there, eyes closed, while she waved the bottle around and sprayed and sprayed. It was great. The farthest place away from my nose is. . . my feet!! Ooh — think of how nice my laundry hamper will smell with my old socks smelling of Kelly Caleche mixed in with the towels! p.s. although it's a little harder to lift them to my face these days. . .
My feet, that is. Think I'll stick with the wrists! Interesting, Bela. And yet I've read on these very pages that French women, unlike American women, apparently, use their scents comparitively sparingly. Now I'm all confused! Dear Angela/Bela/fellow posters: how much, exactly, is enough fragrance — but not too much?? I did say 'years ago'. I'm talking 30-40 years and beyond. It was obviously too much. You came out of the shop reeking with perfume, but it was fun. I wished I'd experienced it, Bela. Lucky you! PS I use very little perfume. My French friends do too. Hmm. Lots of nerve endings on the insides of forearms, I'd imagine. A spritz on the inside of each ankle would be perfect! Thank you! I wish we were, in fact, sitting around the fireplace and talking about perfume. I'd love it. Reading your comment, I feel like taking out all my scarves and scenting them. Now, though, my Theorama has worn off, and I can dab myself with some luscious extrait. Maybe I'll choose Alpona. Its orange can work off of the Theorama. B, I love imagining the lush cloud of scent in your story. How luxurious! I'm sure it would never happen these days. R, in my mind, finding the right amount of perfume to apply is always the changing formula of (1) what perfume you're spraying, (2) who, if anyone, you'll be near, and (3) how much scent you feel like putting out there to the world. I try to err on the side of too little scent rather than too much, but I know when I'm home alone I can stink up the whole house. And I love it. I know. As a child, I used to love going to the parfumerie with my mother because I would get 'parfumée' too. It is so interesting to hear how others apply perfumes,and last year anyone could probably detect “my” coat but now that I like such a variety,the scents are spread out on diff sweaters and coats. I love the thought of a little spray behind the neck,smiling at Robin's spooning comment,it would be so perfect for this!! Thank you! I might have a lot of coats, but I have even more bottles of perfume, so my coats all smell different, too. And I also really like Robin's nape of the neck suggestion. Oh, Angela, just love you! Credit must go to Rose for the original nape-of-the-neck mention! And Angela, thanks for the comments on quantity. It's true that it all depends. My DH has to get hit with a tablespoon of EdP — a good seven or eight sprays — to really notice anything I wear, and I LOVE that!! It means I can absolutely drench myself in really heavy scents at home with complete impunity. It feels so decadent and extravagant, and the whole apartment smells of it. Mmmmm. Also relieves the guilt factor of having so many full-size bottles around (an occupational hazard of living in decant-unfriendly Canada) because I can use juice in such quantity. True about time and place. Just last week, I recklessly wore a whack of Madness on the early morning bus, and a woman actually moved away from me to sit a few seats back. I know it wasn't the wisest choice for Tuesday at 7:30am in a public place, but it was cold and rainy and that spicy warmth was just what I needed. I did feel bad. . .and feel better for this confessional. At least I wasn't wearing Kourus (wink to Kevin vis-a-vis his excellent article this morning)!! A “whack” of Madness sounds perfect for your cold and rainy commute. I think you could have picked far worse scents to wear on the bus. It's not like it's July. If it had been me, I'd probably have moved over to sit closer so I could sniff you. Awww, I wish it HAD been you. I'm sure you would have smelled good to me, too! It sounds like the perfect situation to have a spouse who isn't overly sensitive to fragrance! Yes, Angela; in fact, I'd recommend it to any fragrance fanatic: when it comes to applying perfume, just make sure your partner could happily be drenched with ANYTHING you chose to wear at any time of the day or night — in fact, that he/she adored every single thing you ever chose to put on, from rancid 30-year-old Arpege to Britney Spears newest and fruitiest. You will then never, ever go wrong and live happily ever after. P.S. In the mornings, after cozying up to my DH with a new lashing of morning fragrance (am I the only one who sometimes wears two or three scents per night, spritzing new scents at 1, 3 and 7am?) guys on his worksite frequently comment on how good he smells! It's usually something quite girly, but he doesn't seem to mind! Brave guy . .
Compliments on a nice article Angela. Misting works very well only with the stronger more potent scents and then only when one walks through the cloud completely in the buff. Now, based on my experiences with her when she turned up, say, in Habanita or any of the darker Carons, she had it spot on. What you say makes a lot of sense to me–both the “in the buff” so that the scent can warm and the part about choosing potent scents. I'm dressed now, but tomorrow morning I'll give your technique a try! The guys at his worksite are just plain jealous, I bet! Robin, the back of the hands has the disadvantage of being washed off frequently during the day. I spray on the back of my wrists for the same effect you get, plus it's a bit warmer spot. And, unlike the inside of my wrists, the outsides don't seem to get splashed when I'm washing my hands or dishes. I'm pretty conservative when applying perfume. I'm pretty much done in one or two tiny sprays, and then that's it. I start by applying the scent just above the inside of my wrist, and then I dab that onto the opposite wrist and then behind my ears. If I want a little bit more I spray a little bit on my collarbone and I “dab” it downwards between my breasts. My body doesn't exactly eat scents, so I don't have to worry about that. But my body chemistry tends to bring out the sweet notes in just about anything I wear, so I tend to stay away from any sickly sweet scent. Maybe one of the most important parts of applying perfume is to know what your body does with it–which you do! I decided to give the re-applying thing a try, since I'm new to the whole fragrance thing and am not empathetic enough to understand that other people can still smell the fragrance on me after my nose has formed an immunity. I'm sure it's all a matter of what fragrance and personal body chemistry, but I put on Fleur du Male around 11am and then put on a second application around 8pm. The second round just smelled like alcohol and soap. Definitely a downgrade. Guess I'll just have to learn some patience. Fleur du Male must have real staying power to interfere with a reapplication after nine hours. I'm with you, though–I try not to reapply unless I feel like the scent has barely a whisper of life left in it. Lots of people do reapply, though, and like it. Yeah, the staying power's really good. The first time I ever sampled it in a department store, it stayed on my skin all day and there were traces of it when I woke up the next morning. Angela may chime in as well, but wanted to say that I've many scents that I find overwhelming when sprayed, and I just decant them so I can dab on smaller amounts — plus that way you can carry a small bottle with you to reapply. Oh no! that sounds terrible. I second Robin's suggestion that you spray your perfume into a little bottle and then dab it on. It sounds like your perfume is pretty powerful. Angela, I've always sprayed on my clothes instead of skin mainly because it last longer but recently I've been annoyed by the fact that the fragrances stay quite linear on clothes (and there are some that I prefer to have the top notes fade as quick as possible) so I've been spraying on skin – neck, back of neck, chest, inner elbows but the fragrance never lasts. Any tips on making it stay longer? I heard about the layering with the same scented lotion but not all fragrances come with matching body products (or maybe I just dont want to spend anymore) and I also dont want to reapply because I like to smell the fragrance develop..
Is your skin dry? Mine can be, and I notice that scent stays longer if I apply it over lotion, but I use an unscented shea-butter lotion. (If I had to have scented lotion for every perfume I have, you'd have to write to me at the poorhouse!) I haven't noticed any problem with fragrance development if I rub in the unscented lotion, wait a bit, then apply scent. Yes I do moisturise and my skin is pretty oily anyway. It just doesnt seem to stay as long as I want it to.. I wish I had better advice for you. At least since it burns off so fast you have the opportunity to wear many perfumes in a day. I agree totally with you about the movies! I loved The 1939 version of The Women; but hated the 2008 version. You're right – it's sacrilege! 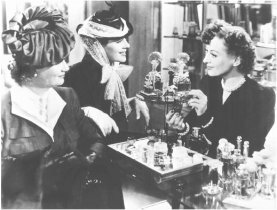 Like you, I enjoyed this scene at the perfume counter – women knew how to shop for perfume in those days, when the wearing of perfume was a serious ritual and no woman would be caught dead not wearing any. I always encourage both my male and female friends to wear enough fragrance to be noticed and commented on; but sadly, most people are clueless about fragrance and consider it an afterthought to be schpritzed once when one is going out on a special occasion. I haven't seen the 2008 version, but the reports I've heard aren't good, including yours. The ritual of perfume is wonderful. Sometimes perfume counters at department stores aren't very much fun, because the salespeople so often say everything smells great.